Many years ago I promised Graham Arnold that I would write something for Club Lotus when the restoration of Essex 004 was completed. It has taken me many more years than I expected, sadly Graham is not with us to see it finished. The story starts in the summer of 1982 when I first saw Essex 004 and had no idea at the time what it was, but it left a lasting impression. 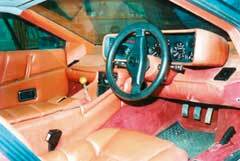 Wheelhouse was the local Lotus dealer in Nottingham in the 1980’s. Essex 004 was in their showroom for sale in June 1982 now with registration PAL 396W. (Replacing private plate VAP 50 which replaced its original registration number GBO 4W now back on the car.) At the time, Wheelhouse’s daughter Tracy was dating the car dealer who lived a few houses away from me (years later he was shot and killed while in Russia selling time share). On this particular sunny Saturday afternoon while washing my car on the drive Tracy came down the Avenue in 004. The blue, chrome and red shimmering in the sun as she cruised past, I almost dropped my sponge. 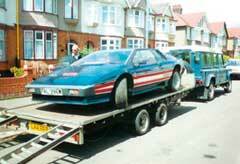 Little did I realise thirteen years later I would be starting the restoration of the very same Essex Turbo. Later in June 1982 Wheelhouse sold the car to a Mr Denis Carlton-Conway subject to a vehicle inspection report carried out by the AA at 14437 miles. This report gives a detailed account of the condition. The paintwork to the sills and front panels was already showing heavy stone chipping and on the door and rear spoiler edges the paint was down to the primer (too much polishing). The windscreen had been replaced and it was minus the chrome strips, the front right hand corner showed signs of slight damage and the driver’s door frame was cracked etc., not particularly good for a two year old car that cost over £20,000 new. I wonder how much Carlton-Conway paid for it ? The comments in the report are interesting regarding the spare wheel as to being the “wrong size” and that it had not been given legal sanction and a decision was still pending on legal validity. Essex 004 was supplied from new by Lotus dealers Goldblatt in Cardiff and first registered 01/9/80, older brother to 007 registered 30/9/80, and 014 registered 01/11/80 both also by Goldblatt .The factory build book details record 004, chassis number 0899 as the Press Car, earliest of all the Essex, preceding Lotus records, which record Turbo production starting at chassis 0900. When the body was removed from the chassis, on top just behind the gear stick I found notes written on masking tape referring to the chassis being overhauled, new bushes hub carriers and bearings etc. which makes me wonder if it had another life, but this was Lotus so who knows. I first saw 004 for sale early 1995 in the Club Lotus magazine; the ad said needed new paint. When the next issue came out and it was still there not sold, I decided I must go and have a look, if nothing else, out of curiosity. 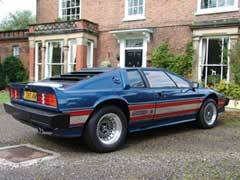 Soon afterwards in Barry Ely’s garden I was standing next to a very tired Essex Turbo. Barry Ely acquired Essex 004 in February 1987 his original intention was to restore it but he never got round to it. The last MoT which came with the car, issued in October ’84, showed a mileage of 34,671. This August (2007) it was taxed and MoTd again for the first time in almost 22 years, having covering just 269 miles in all this time. For eight years it had stood in Barry Ely’s garden deteriorating year by year, the rusty suspension entwined with dead weeds. Opening the door I was greeted with the musty smell of damp accompanied by faded leather now more orange than red. The Compomotive wheels were corroded and pitted and had that white aluminium oxide look that says I’ve been outside for a long time. As for starting 004 it looked as though it had been dead for a long time, and didn’t want waking. The engine compartment was filthy with a layer of dust and oil and oxidized aluminium surfaces. I asked myself, is it worth saving, and how could a car with only 34,940 miles be in this condition? 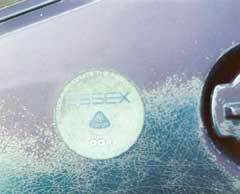 The lacquer from an earlier top half paint job (reference vehicle inspection report) had crystallised and what was left just rubbed off. My wife was still in shock as I made the necessary arrangements to transport it back to Nottingham. She couldn’t understand how I had actually paid money for this thing as she referred to it, and on top of that it didn’t even go. She thought Barry should have paid me to take it away. Once back in Nottingham it was rolled off the trailer down the drive and into my garage where it would spend the next 11 years. I needed to have a good look at it and formulate a plan of attack. One of my first jobs was to contact DVLA who agreed to let me have the original registration number back, GBO 4W. It soon became clear that a complete overhaul and a full restoration would be required. The idea was as far as possible to rebuild as new, so the level of finish required the utmost attention to detail, literally everything was stripped, overhauled, shot blasted, powder coated and painted as required. Every nut, bolt and screw was either zinc and yellowed or replaced. The long process of dismantling started with photos and a video record. Everything was itemised all nuts, bolts and screws bagged and labelled. I started by removing the bumpers, followed by front and rear lower spoilers, a job in itself as the aluminium pulserts with steel screws had all seized and span round in the fibre glass body. They were replaced using a plate with nut welded on in stainless, pop riveted to the body, a much better idea. Next the engine and transmission were removed. Briefly the engine was completely stripped (the amount of sludge that had built up in the crankcase water jacket was incredible). After cleaning the aluminium castings everything was checked, valves reground and clearances reset and reassembled. 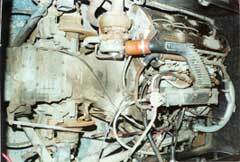 Later type stretcher head studs were used, new timing belt and tensioner. The transmission was cleaned, but apart from helicoiling the stripped rear cover screws holding the exhaust mounting plate straps there was no reason to dismantle. The exhaust casting holding the waste gate was replaced, the valve seat eaten away and cracked. Now it was time to remove the body from the chassis, firstly the duct holding the radiators was removed, then all the bolts holding the body removed with spacers, noting what went where. With everything disconnected the body was hoisted off the chassis. 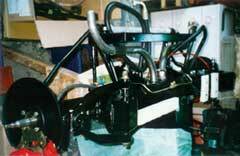 Again briefly the chassis was supported on trestles and all the rusty suspension parts removed. All the aluminium water pipes running through the chassis had rotted away on the ends. It was decided to have a complete set of new pipes made in stainless. 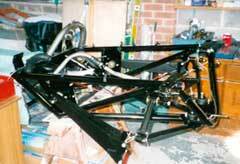 The chassis went away for cleaning and then powder coating in black to match the original finish. All the wishbones and trailing arms were shot blasted and powder coated and fitted with new bushes. The original springs were retained, powder coated red. New shock absorbers, new brake discs, new wheel bearings etc. 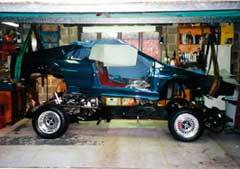 The Compomotive wheels were a challenge - I remember one winter spending very many hours on them. I never noticed at the time but the left rear was different from the other side. Steve Stallwood, the last owner who I briefly spoke to, explained that on the way down to Monte Carlo the wheel broke up. Compomotive had to fly a new wheel out so this is why it was different. 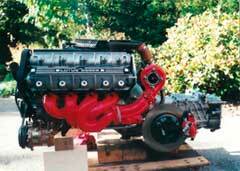 As the first years rolled by the initial enthusiasm had seen the engine and chassis rebuilt. By now the enthusiasm was starting to fade a little. Work and other commitments pushed the Essex into the background. The finished chassis was wrapped in what I can only describe as industrial cling film and hung up from a girder in the garage out of the way until it was required. 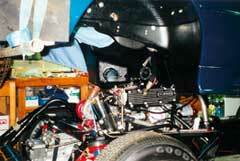 The engine and gearbox sitting on a trolley was also covered and pushed into a quiet corner. Progress continued to be slow. I found that every job had to be planned and if it went wrong or the results were not good enough it was better to walk away for a rethink rather than try to push on. I had planned to use all or as many original parts as possible but in some cases old parts no matter how well cleaned and polished didn’t give the level of finish required. By now I was spending more time on my other hobby, investigating Essex build numbers and where they all were. 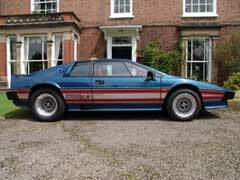 The amount of information and photo’s collected over the period was brought to a conclusion after Jeremy Walton contacted Brian Angus at Lotus for the correct information on Essex build numbers for his forth coming new Esprit book. The amount of information unearthed by Chris Brown from deep in the Lotus archives plus all the time spent by Brian chasing leads and making enquiries resulted in an almost complete record. For my part my email travels had taken me to South Africa, Japan, California, Germany, France as well as the UK searching for various Essex and the pre-production Lotus engineering Essex. I never realised the amount of interest Essex Esprit’s generated. All the information was collated to produce the Essex Data Base. Next the body shell was stripped down ready for its trip to Norfolk for new paint. The amount of work involved preparing the body shell and all the separate pieces was a test of Jerry Hill’s patience (ex Lotus body shop). The original leather was like parchment paper, so brittle and so badly faded after 2 years in the Monte Carlo sun (I was later to find out) and spending another eight years living outdoor’s, so replacement was really the only option. The new leather incidentally was provided by Mel Broome and the Lotus trim shop. I’m not going to try and work through the long and tedious job of rebuilding the body and interior. I’ve already missed out loads of other things not wanting to bore anyone who is reading this with all the minute details. 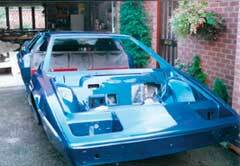 Once the newly painted body was back from Norfolk everything was prepared ready for lifting the body on the chassis. (The engine had already been installed in the chassis and ran up just to make sure everything was working correctly). Gently lowering the body into position, all the bolt holes were lined up, bolts inserted and tightened up, making it look like a car again. More years rolled by but gradually the body was completed. The Essex door stripes were applied before the doors were hung on the beams. Fitting of the dashboard and instrument binnacle was completed with all the switches and gauges followed by the rest of the interior. By now it had taken that long, time didn’t matter anymore; the only thing that did matter was getting it right. I lost count of the times I put something together only to take it apart because I wasn’t satisfied. Skipping a few more years, one of the last jobs was to recharge the air-con, something I had put off for a year convinced that it would never work. The only part replaced was the high pressure hose from compressor to condenser. Once the system had held a vacuum and the ozone friendly gas was in I was amazed when it worked first time. I had now reached a point where I was working through my jobs list one by one ticking the jobs off. It was now 11 years since I started, people had been talking behind my back “he’ll never finish it” but the jobs list was getting shorter and soon it was ready for its MoT. My friend Aubrey who always does my MoTs was completely blown away, down his inspection pit with his light “how can a 1980 car look like new?” He stayed down there for a good while just staring up inspecting the chassis. By this time we had a small audience taking photos, everyone wanting to know what it was, and it passed. Next stop was a suspension geometry check, front tracking adjusted and left rear right too much toe in which was surprising as all the original spacers were back in. So with insurance, MoT and now tax I started taking it out on some quiet roads in the evening ready for a drive down to see Jerry in Norfolk for the final finish and polishing touches to the paint work. It was a small miracle it made it there and back. I’m always being asked how much did it cost to do. All I can say is I have a big box file full of receipts and one day I might just add them all up (when my wife is not around!). Many of the receipts are from the Norfolk Motor Co. where I initially sourced my parts when rebuilding the engine. I later changed and used SJ Sportscars, a wise choice as Steve and the guys have always been very helpful, thank you for being so patient with me. For 004’s first official outing I went down to the factory for the 40th in September, to be displayed in the Lotus line-up. Thankfully there wasn’t any engine trouble, but you never know with an old Lotus, a breakdown waiting to happen.